The GPS-competition Version of the ASG-32 is designed by FW-models for Tomahawk , the design was calcultaed for extrem dynamic perfrmance . The wings construction is made from carbonfibre to meet highest levels of durability , the to layer is fibre-glass. 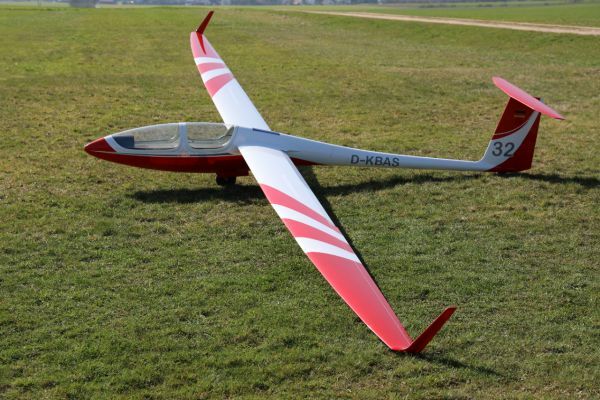 The airfoil is extremly thin and starts with 10% at the beginning anf edns up at 9% att the wings end. The full kit includes carbon reinforcements and is being produced using vacuum technology. The kit is well under 25kg in weight. We offer a wide variety of accessories like retract landing gear, cockpit, covers and others. Related links to "ASG 32 GPS-competition 7,7m carbon version"